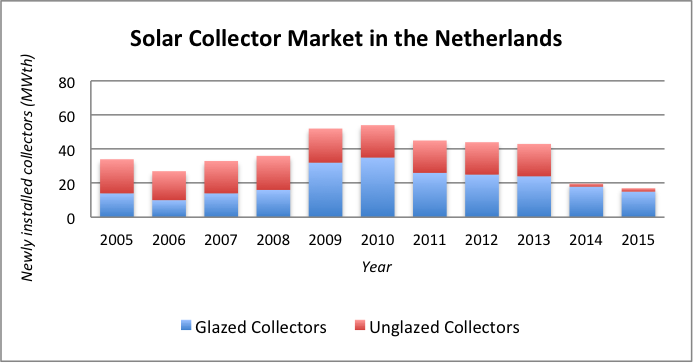 The market in the Netherlands for solar water heaters has been stable, but small, since the subsidy scheme ended in 2011. The main market is domestic hot water systems. Systems for space heating are in general too large for the small houses in the Netherlands, but the interest for these systems is growing. The market was focused on new houses, but as there is less housing development, the focus has shifted to existing houses. The main application is domestic hot water. The systems are mainly pumped systems with still a lot of drain back systems, but the number of pumped systems with glycol is increasing due to imports from other countries. The systems are in general about 3 m2 with a 100 l tank. Larger systems are used for agricultural, for example in dairy farms for cleaning. Another development is the solar thermal roof. This is an uncovered collector that is integrated in the roof of a building. The application is the regeneration of aquifer thermal storages of borehole storages. Recently many of these systems are combined with PV in PV-thermal systems. Large systems are in use for hotwater for multifamily buildings or institutional buildings with a high hot water demand. There is one large system connected to the district heating network: the solar island in the city of Almere from Nuon. The main market driver is the building regulation for new buildings. The regulation requires a certain performance level and solar water heaters help to reach the requirement. There is a lot of competition from other technologies like PV. Due to the EPBD in 2020 new buildings have to be almost energy-neutral. This should give opportunities for solar thermal systems in houses. For existing buildings there is an energy label, but there are no demands to the required performance. Most installers are still not very active in selling solar water heaters. Hot water is mostly produced with efficient gas boilers and gas is cheap. It is therefore difficult for solar water heaters to be cost competitive. The main sales in existing buildings is with owners who specifically chose a solar water heater for environmental reasons. Large systems (> 200 m2) can benefit from a feed-in tariff from the SDE+ scheme. In 2016 several large projects were proposed for heating greenhouses. A workshop in 2017 about the results of IEA task 45 an 55 showed that there are good opportunities with this subsidy scheme for large solar thermal systems connected to district heating networks. There is a domestic manufacturing base, but it has decreased over the last years. After the subsidy stopped in 2011 many manufacturers decreased their production. The growth now comes mainly from newcomers who import systems from Europe or China. The few manufacturers are coming out with innovative solutions, such as a polymer tank and a collector the size of a PV-panel. Several companies have developed PVT-panels, but the market for PVT is still small. Estimates from the trade association Holland Solar range from to 300 to 500 jobs (full time equivalent) in the Netherlands for the solar thermal industry, including installation and related service (testing, etc.). A solar water heating system costs around €3300 for a 3,5 m2 system for a household of 4 persons. This is the price for an installed system including VAT. Prices vary considerably depending on the project size, system type and ease of installation. There is a quality certificate for installers (zonnekeur). This is developed both for solar thermal and PV installers. The focus in the Netherlands is on houses not using natural gas anymore. The government aims at a carbon neutral build environment in 2050. Active and passive solar technologies and daylighting are included in the rating system, but there is no separate focus on solar buildings. For new buildings the aim is that all new buildings should be near-zero by 2020. For existing buildings there are no obligations but several projects aim at energy neutral renovations. Examples are the Green Deal aardgasloze wijken (Green Deal neigbourhoods without natural gas) and Transition Zero energiesprong.nl/transitionzero/ that targets high level renovations to come to net zero in existing houses. The interest in space heating with solar is growing. Also combinations of solar heating and heat pumps are growing, but there are still a lot of different configurations in use. Daylighting and daylight control is popular. Most modern enery efficient offices have daylighting control. There is an active community simulating the use of daylight: www.livingdaylights.nl . Starting in 2020 all new Dutch houses are to be build almost energy neutral. It's difficult tot predict the amount of new houses per year, but last year (2015) about 50.000 new houses were build. It's likely that from 2020 on a structural part of this amount is going to be equiped with solar thermal systems. There are two main drivers for low energy buildings. the first one is the aim to make new building near zero energy buildings by 2020. Many players are already developing concepts for these types of buildings. The second one is the movement "Transition zero" mentioned above. The aim of this movement is to make about half a million existing houses energy neutral using industrial methods. As of now, a couple hundred so called prototypes have been made. Allmost all of them are equiped with PV systems. Thermal systems are rearly used. The project Transition zero aims at renovating an existing row house to net-zero energy for an investment of 45 000 euro. There is no national R&D program for solar thermal energy. The program for renewable energy at RVO.nl does include a few activities for solar thermal energy. The Netherlands developed the drain-back technology for solar water heaters. For heat storage the focus is now on chemical storage technology. The goal for renewable energy is set at 14% in 2020 with the EU and there is a national energy agreement that aims at 16% renewable energy in 2023, see www.energieakkoordser.nl. There are no official goals for solar heating. The trade organisation, Holland Solar, has made a plan to accelerate the market. The main agency is the Netherlands Enterprise Agency RVO.nl (formally named AgentschapNL and SenterNovem). Commercial businesses can still benefit from the tax-reduction for energy investments (EIA), which comes to about 15% of the investment costs. The ISDE support scheme was introduced in 2016. It is an investment subsidy. The subsidy level is based on the output according to the documentation of the European Energy Labelling system. The investment subsidy is €0,75 per yearly kwh produced for systems up to 10 m2. This is about €750 for an average system. Folr large systems the feed-in tariff (SDE+-scheme) is applicable. This is a feed-in tariff that has been expanded to include large (>200 m2) solar heating systems. The feed-in tariff works using a tender system. The tariff is between €0 and €0.08 per kwh produced useful heat. For solar buildings, the main incentive is the building regulation and local climate policies. The so called TKI Urban Energy provides support for innovation of Solar thermal systems and integration of those systems in the building envelope. Subsidies are available for research, development and demonstration.